The books highlighted below have been written by A&DHS members. Not all are still available for sale but are on the shelves at Albury and Lavington Libraries. More titles can be found at our Publications page. 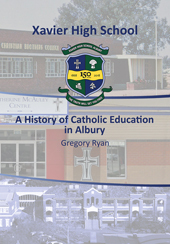 This book by Greg Ryan, published in 2018, begins with the first Catholic school in Albury in 1855, about 90 boys and girls under one teacher in South Albury. In 1868 the first Sisters of Mercy arrived in Albury. In 1917 Albury’s Christian Brothers’ College for boys was established – the school became Aquinas College in 1959. CBC/Aquinas and St Joseph’s Ladies’ College evolved independently until 1983, when co-education was reinstated with the amalgamation of the two schools to form Xavier High School. Alumni include a Senior Australian of the Year, an Australian Attorney General, an Australian Ambassador to the US, three judges, a Brownlow Medallist, a Wimbledon Champion and many others who can claim impressive achievements. The book is available for $35 from the Xavier High School Office, Albury LibraryMuseum and Dymocks Albury. 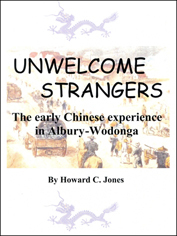 A book by local historian Howard Jones, explores a time of particular hardship for Chinese men crossing the Murray at Albury-Wodonga in the 19th century. Hundreds were jailed, fined, taxed and robbed and, as non-whites, were abused by newspapers and politicians. Published in 2017, it is part of Albury & District Historical Society’s series of academic papers. It describes the cruelties inflicted on the Chinese by both Victoria and New South Wales at the Murray because it was a colonial border. However they played a very beneficial role, keeping the whole population of the Border healthy by supplying fresh food and vegetables. They worked in many jobs including cooks, laundrymen, storekeepers and planted tobacco. ‘Unwelcome Strangers’ is available from Dymocks and the Albury LibraryMuseum for $20. 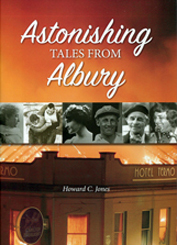 If you like mad, sad, bad or bizarre stories about Albury, see this book by former journalist Howard Jones. More than 50 true tales recall grim tragedies such as a mass drowning of canoeists on Lake Hume, a midwife’s ghastly railway death and a love story that ended tragically at Albury Gaol. Scandals like the Tietyens’ Investments collapse, as is a reported sighting on a flying saucer. Jones writes of bigamy, bigotry, and of a Communist teacher pelted with eggs and rocks. Local tales are told of celebrities like Don Bradman, Nellie Melba and Bert Hinkler and criminals Mr Stinky and Joe Byrne. Published in 2017, it is for sale for $20 at the Albury LibraryMuseum or from the author. 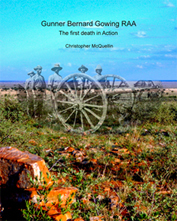 A&DHS Occasional Paper No 28, published in 2017, is a 32 page booklet relating to the service of Gunner Bernard Gowing of the Royal Australian Artillery. He was an Albury resident and the first soldier from the Albury community to be killed in action, in South Africa 1900. Cost $10.00 plus postage if required. Available from the author: Chris McQuellin – phone 02 6021 3697. 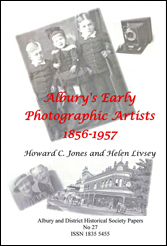 Albury historians Howard Jones and Helen Livsey collaborated in 2016 to write another publication in Albury & District Historical Society’s series of Society Papers. Julius Rochlitz was the first to bring his photographic equipment to Albury in 1856. Over the next 100 years many others followed to record Albury on film. This book is available from the Albury LibraryMuseum or from Dymock’s Bookstore for $15. A&DHS published this book in 2017 to help celebrate and remember 150 years of band music in Albury. 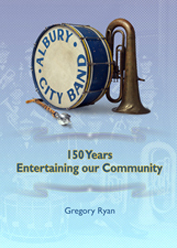 Written by Greg Ryan, it chronicles band music from the first record of a local band in 1855 to the present Albury City Band. The history of the band mirrors the history of Albury itself as the band has been present for almost every major event in our city’s past. 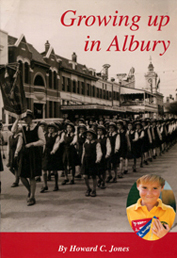 The book, containing about 130 historic photographs, lists over 800 men and women who have been band members in Albury. It is available for $35 from Albury LibraryMuseum or directly from ACB. 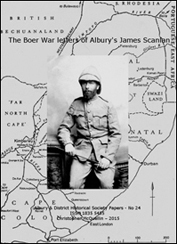 A&DHS Society Papers – No 24 The Boer War Letters of Albury’s James Scanlan (2015). Scanlan was a active member of Albury’s H Company Volunteer Infantry in the NSW Military Forces before Federation. In 1899 he was to sell his Townsend Street bicycle shop and enlist in the NSW Infantry. His Infantry Company departed with the first contingent to South Africa in 1899. His letters home tell his war story. 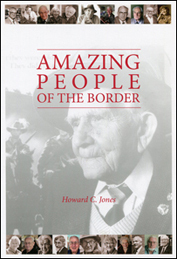 Copies can be purchased at the Albury LibraryMuseum or order copies by contacting Howard at his email address. Price $20 including postage. 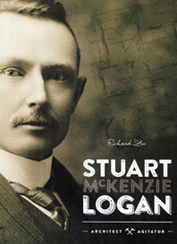 The book is available for $20 from the Albury LibraryMuseum. 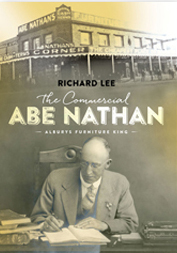 Richard Lee’s The Commercial Abe Nathan, Albury’s Furniture King (2015) tells the story of a successful furniture warehouseman who came from Prahran Victoria to Albury in 1908, continuing a sound business career using the time-payment system. Despite a devastating fire within 2 years of setting up, Abe rebuilt and recovered, expanding to Wagga where his son was manager. Generous and sociable, Abe made his mark in the town, donating to worthy causes, rescuing the Commercial Club from a precarious financial position and investing heavily in rental real estate. As age and illness took its toll, Abe sold to Maples Furniture as they expanded into New South Wales. The book includes details of Maples and Patersons Furniture at either end of Albury’s main street, and Maples Albury managers branching out on their own. When Clarke Rubber Ltd took over Maples in 1979, 70 years of furniture retailing ended on what had been Nathan’s Corner and then Maples’ Corner. Two books relating to Albury’s involvement in World War I were released to commemorate 100 years since hostilities commenced on the Gallipoli Peninsula. Albury at War 1914-1919 (2015) was written by Douglas Hunter and tells the story of men and women from Albury and surrounds who served in the Great War, and of those at home who maintained and sustained them throughout the five years of conflict. The book draws on research done by members of the Albury & District Historical Society using newspapers held at the LibraryMuseum. Also The Grandfather I Never Met, (2014) the story of arguably Albury’s most decorated soldier, Charles George Bishop, written by his granddaughter, Janine Agzarian. 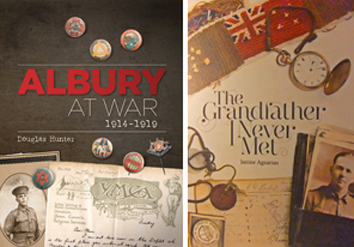 Both books are important contributions to the story of Albury’s involvement in WWI and are available for sale at the Albury LibraryMuseum. 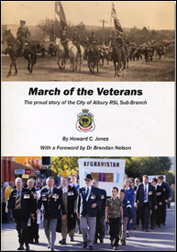 March of the Veterans (2014) is “the proud story of the City of Albury RSL Sub-Branch.” Author Howard Jones traces the history of the Albury branch of the Returned Soldiers Association of NSW since its formation in 1914. 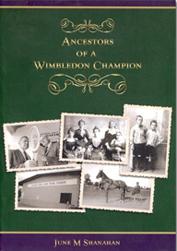 Ancestors of a Wimbledon Champion (2010) by June Shanahan tells the story of June’s sister Margaret Court (née Smith) and her ancestors. Margaret grew up in Albury and became one of the greatest tennis players that the world has seen. Available from the author – phone 02 6025 1324. 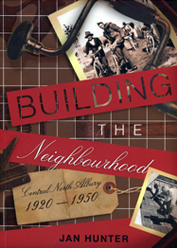 Building the Neighbourhood (2007) Jan Hunter writes about the development of the North Albury neighbourhood, focusing on the houses built by her father Leslie Chick and telling the story of the community of residents in the area. 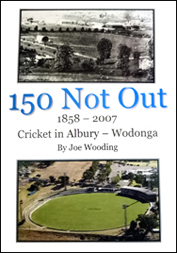 150 Not Out, 1859-2007 – Cricket in Albury-Wodonga (2007) Joe Wooding writes a thoroughly researched book on the history of cricket in Albury from the first organised game of cricket played in Albury in February 1859. It features many great names of cricket with details of some of the games in which they participated. The book includes many interesting anecdotes about the life and times of the region. Available from the author, phone 02 6021 4887 . 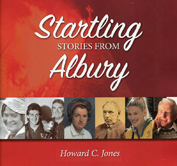 Growing Up in Albury (2001) is one of a series of books by Howard Jones, including Magic Memories of Albury, Vanishing Albury and Good Old Albury featuring images from Albury’s past. Some of the titles are available for purchase at the Albury LibraryMuseum.